Just as if you were in Marrakesh (Morocco), getting out of Bangkok is just as important for a trip to Bangkok as visiting the city itself. One excellent day trip from Bangkok is the “River Kwai Tour and Death Railway Train Ride through Kanchanaburi”. We opted to try this out after spending a full month in Bangkok (and working on our blog while taking care of our baby) - so, it took us a while longer to get around to it - but it was an AMAZING adventure through some very important parts of Thailand. Additionally, it is absolutely filled with history from WWII. “The Bridge on the River Kwai” (1957) - The original classic - which is deemed to be less realistic according to a number of historical experts. First, the shuttle needed to pick us up at/near our place of stay (we were picked up at the Avani Atrium Hotel which was about 2 miles from where we were actually staying and required getting on a local bus around 5:15-5:30 AM so we could meet them at 6:00 AM. However, if you’re in their typical pick-up areas you may not need to worry about being ready until around 7:00 AM). After being picked up, we were brought to a central grouping area on Khao San Road. If that’s where you’re staying, then you may have until 7:30 AM to arrive! Once we were sorted into our correct groups (shuttles from all over Bangkok had been picking up people and dropping them off there), you’ll get on another shuttle which will bring you to your first stop. On this tour, our first stop was JEATH War Museum, located inside a temple compound beside the River Kwai. 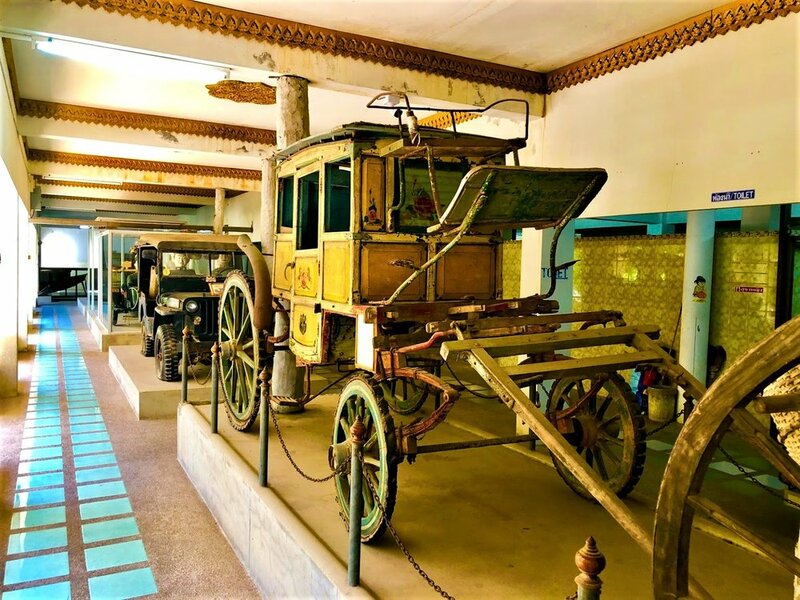 You will get to see some historical artifacts from the WWII era, learn about the two original bridges, see the remains of the wooden bridge, and have a few great views of the remaining metal bridge over the River Kwai. Our tour guide gave us 30 minutes for this War Museum. The entrance fee was an extra 50 baht as well. 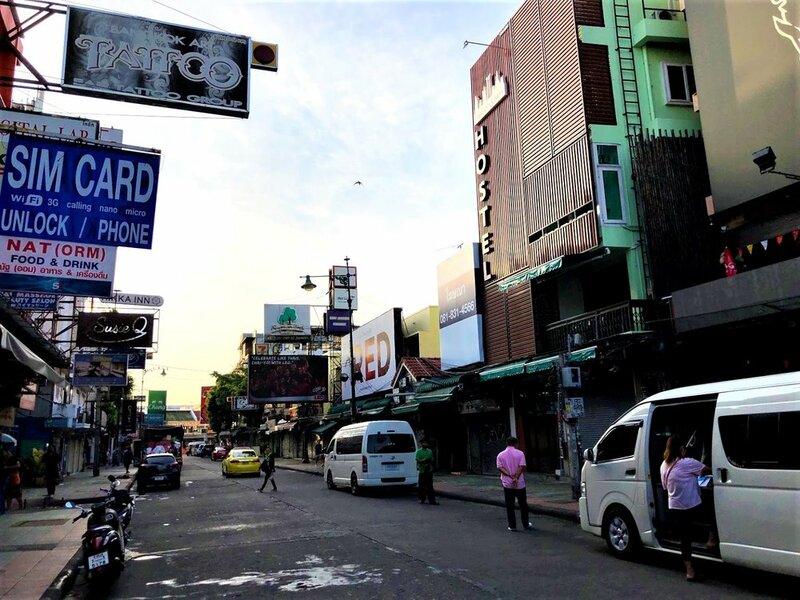 Additionally, you are given another 30 minutes to spend at the Bridge itself, which is just a block away and past a 7-11, some souvenir shops, and a small outdoor market. This is a very historic bridge and it goes along with the story of the "Death Railroad", which cost the lives of between 106,000 - 115,000 prisoners of war and Burma/Siam civilians during WWII. If you are not interested in the JEATH War Museum, you are permitted to spend the entire 60 minutes at the bridge or walking around the area. The bridge itself is a fairly unique experience. As you walk across, it is simply some metal plates that create a walkway on either side, or down the middle, of the bridge. A train was coming down the track while we were crossing the bridge – but we had plenty of time to move out of the way (it actually stopped prior to the bridge, blew its whistle a few times, then slowly began to cross the bridge itself). Even if you are on the bridge while it is approaching, there are several platforms on the sides that allow you to safely move out of the way while the train goes by. Many great photos can be taken from the bridge, the nearby temple, or the river while crossing over. Once the group has met back up at the JEATH War Museum (that was our meeting spot after the 60 minutes were up), we headed back to the train track and were told about the ability to “upgrade” our seats on the train if we desired for 100 baht each (not required). The upgrade would guarantee a seat on the train and come with a complimentary ice-cold towelette and cup of water. We did upgrade and we were happy to have seats with a fan overhead (not super necessary once the train was moving as plenty of air was passing through the windows). Traveling through the fields and hills of Kanchanaburi was quite pleasant and a really amazing experience. We were also riding on the “Death Railway” itself – so, that can really impact you if you are an emotional or empathetic type. The tour description said that the train “runs through the rock-cutting passage and over the wooden viaduct. You will also see [the] scenic river, rice paddy fields, and rocked mountains along the way.” That was fairly accurate, although the rock-cutting passage that it refers to is the Tham Krassae Bridge, not the “Hellfire Pass”. That bridge, the Tham Krassae, was near the second to last train stop. It hugs the cliffs alongside the river Kwai and is also a primary photo location. You can literally stick half your body outside of the window of the train while taking photos of the floating houses on the rivers edge on one side of the train, or see the rock ledge - and maybe catch a glimpse of the Krasae Cave which was used as a POW campsite but now features a large golden Buddha - on the other side. In March/April of 1943, some 2,000 POW's and forced civilian laborers built the Tham Krassae Bridge, a double viaduct which is 400 meters long and up to 9 meters high in some spots, in just 17 days. So, when you pass over it please remember to think about how difficult it would have been to construct it in just 17 days! Once we arrived at the last stop and departed the train, we walked a short distance to our shuttle, which was there waiting for us. It then drove us to a restaurant that was literally floating on the the side of the River Kwai, where we had a buffet lunch (but had to spend 25 baht each for a beverage if we wanted one – otherwise we could have just drank our own waters). The lunch was sweet and sour chicken, chicken soup, and a couple of vegetarian options (pumpkin/carrot/sweet potato fries and chow mein). We tried them all and they were all quite pleasing. After the meal was complete, a few members of our group had paid for other “additional things” that we were not aware we could add. A few went rafting down the River Kwai to a location where they interacted with elephants (I actually believe they rode the elephants, even though that isn’t something that we would do). While they went in that direction, we headed straight to Sai Yok National Park. It is interesting that we didn’t even realize that we’d be heading to a waterfall on this trip until the shuttle was already on its way, but when we heard that we would be seeing one we immediately expected that it might be the Erawan Waterfall. Well, Erawan waterfall is actually about a 55 minute drive around the park to the northeast. Where we went was called Nam Tok Sai Yok Noi – a different waterfall that also corresponds with our Death Railway tour in an interesting way – there is an old steam engine located nearby the falls (engine 702) that was made by the Japanese Train Corporation and used during WWII along the “Death Railway”. Ah, so now the waterfall made sense to us! “At Sai Yok Noi waterfall stands a spirit house and State Railway Steam Train 702, built by Mitsubishi in 1935 and was sold to the Thai Government at the end of WW II.” - Ben The Man via flickr. We did get to spend an hour at this area, which had a number of things to do, including swimming in the falls, shopping, food, and even some caves up a stairway near the Steam Engine that we were able to explore. I think if we had more time we may have explored another cave or two, but the location was pretty cool none the less. One stop that we didn’t get to make was at “Hellfire Pass” (Konyu Cutting), the famous spot where many prisoners of war died while being forced to cut a path through massive rock hill. That was only 19 minutes farther down the road from the waterfall, so it was a bit disappointing to miss. “Hellfire Pass is so called because the sight of emaciated prisoners labouring at night by torchlight was said to resemble a scene from Hell.” - China Williams et. al. (2007). Thailand. Lonely Planet. p..219. “Soldiers were forced to remove the rock using no more than picks, hammers and their bare hands… It was the largest rock cutting on the railway.” - Ben The Man via flickr. On the way back, we also stopped at one final location - the Kanchanaburi War Cemetery (a.k.a. the “World War II Cemetery”) which serves as a memorial place for the allied soldiers who sacrificed their lives as prisoners of war during WWII. It was quite sobering to see that most of the deceased were aged 23 or younger. Overall, just to see parts of Thailand that you wouldn’t generally get to see, this trip was totally worth going on. However, with the added historical aspect, it turned out to be much better than we expected. While you can grab your ticket to go on the exact tour that we took (the “River Kwai Tour and Death Railway Train Ride Kanchanaburi”), we would actually recommend choosing their other tour that includes the Hellfire Pass (but not steam engine 702) called “Death Railway Train and Hellfire Pass Tour” for 4,370 baht (yeah, it’s considerably more expensive if you want to see the Hellfire Pass). If you’re looking for a more in-depth historical adventure that catches all the spots, try the “ANZAC Ride to Remembrance” tour instead (Taking the “ANZAC Ride to Remembrance” helps support EatWanderExplore). Other day tours that we did from Bangkok are the “Maeklong Railway Market and Damnoen Saduak Floating Market (Joined Tour)” and the “Ayutthaya And Bang Pa-In (Summer Palace) Day Tour”. Interestingly enough, you can get a 3-day tour to catch them all, plus some pretty sweet extras, by booking the “Bangkok to Kwai Adventure” instead (Taking the “Bangkok to Kwai Adventure” helps support EatWanderExplore). Thanks for reading! We work hard to bring you quality posts like this one. Please help us out by signing up for our email list (to be updated occasionally on our newest posts), share this post with your friends, or simply follow us on Facebook, Instagram, Pinterest, Twitter, or YouTube. Thanks again for your support!